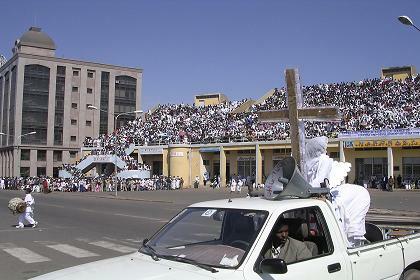 Many thousands of followers of the Christian faith, priests, monks, children and a few tourists are gathered on Bahti Meskerem Square in the center of Asmara, to observe the celebration of Meskel, one of Eritrea's most significant religious holidays and spiritual events, marking the discovery of the True Cross (on which Jesus was crucified) by Queen Eleni (Saint Helena) in the fourth century. I am a bit late. I join the camera men of ERI-TV, staying close behind them, to prevent hindering them in doing their work, and in a perfect position to witness all events: the speech of the head of the Eritrean Orthodox Church, the drama, the prayers, and the rituals. The Asmara police and some military men make sure that the public will not enter the circle around the 'Damera', the bonfire at the center that is blessed by a group of priests, circling in a procession around the Damera three times. the massive wooden construction is sprinkled with kerosene, and set on fire by Semere Russom, administrator of the zone around Asmara. The burning of the bonfire is based on the belief that Elena followed smoke from burning incense to the location of the True Cross. Once she found it, she notified her son by lighting a large fire on a mountain. The direction in which the Damera collapses is also said to predict prosperity or adversity, good or bad harvests after the rainy season. Both the public and the priests come forward, in an attempt to have their picture made with the burning Damera on the background, while the police is hunting groups of children, coming to close to the fire, some even trying to grab a still burning 'souvenir' from the pile of wooden poles. Using sign-language, I ask the police if I can enter the circle, to picture the Damera, when is is about to collapse. It is ok. I make my pictures and politely withdraw, to allow others to make some nice pictures as well. Afterwards the charcoal from the remains of the fire is collected by the faithful and used to mark their foreheads with the shape of a cross. Religious participants. 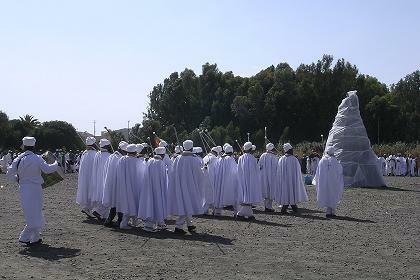 Celebration of Meskel - Asmara Eritrea. Religious rituals. 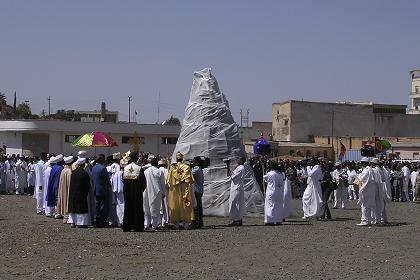 Celebration of Meskel - Asmara Eritrea. Ornately robed priests carrying gold plated Coptic crosses . Celebration of Meskel - Bahti Meskerem Square Asmara. Chanting spiritual songs. 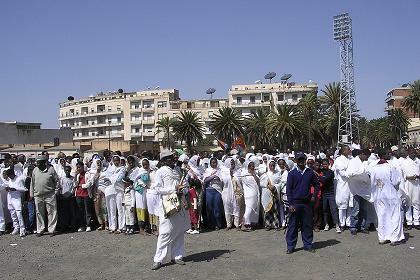 Celebration of Meskel - Asmara Eritrea. 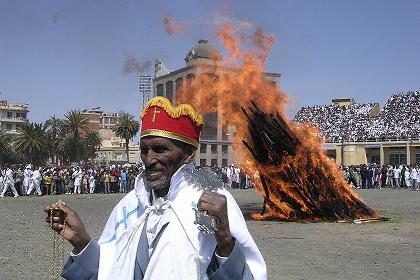 Celebration of Meskel - Asmara Eritrea. Religious drama. 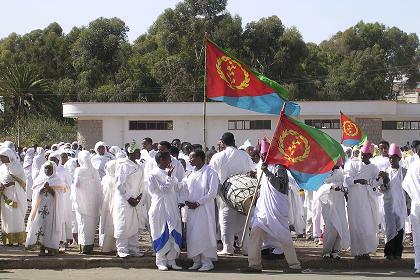 Celebration of Meskel - Asmara Eritrea. Ritual and religious music. 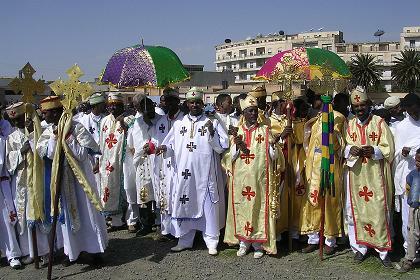 Celebration of Meskel - Asmara Eritrea. Blessing of the Damera by the priests. 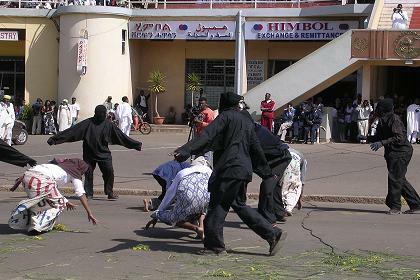 Celebration of Meskel - Asmara Eritrea. Being pictured with the Damera. 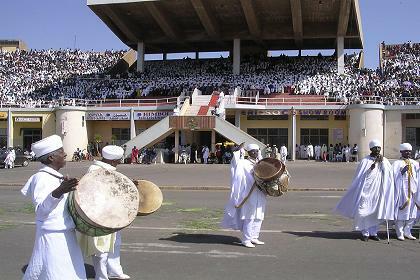 Celebration of Meskel - Asmara Eritrea. The Damera collapses. 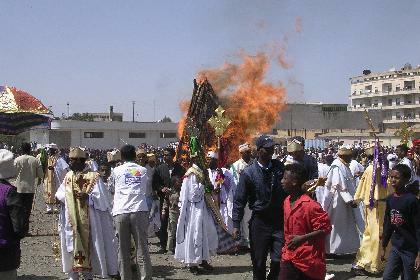 Celebration of Meskel - Asmara Eritrea.